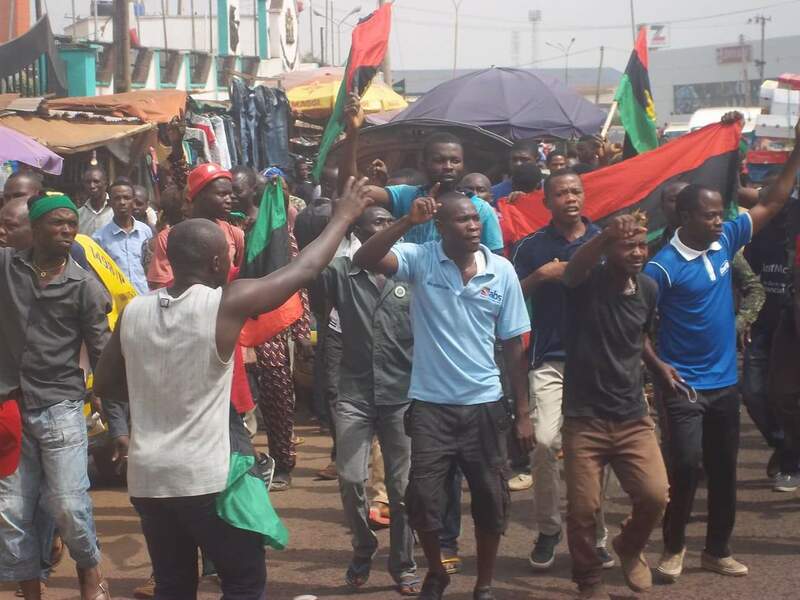 ENUGU— Hundreds of the Indigenous People of Biafra, IPOB, today stormed the busy streets of Enugu metropolis in order to register their anger and displeasure over the proposed visit of President Muhammadu Buhari to Enugu. The protesters who moved from the ever busy streets of Ogbete Main Market crisscrossed through the Central Police Divisional Headquarters and headed to the Coal Camp section of Enugu singing, and shouting. They vehemently opposed the use of masked witnesses in the ongoing trial of the leader of the Indigenous People of Biafra, Mazi Nnamdi Kanu at the Federal High Court, Abuja, saying that Buhari must obey Biafra and release their leader. The atmosphere has been calm and peaceful, with little or no traffic jam but vehicular movements are being controlled to restore normalcy as people went about their normal businesses. However, according to our sources, it has become certain that President Buhari will no longer visit Enugu as speculations are ripe that he might have cancelled his planned visit. Stay tuned for more update as they unfold. BIAFRANS CAME FOR PEACE BUT MBUHARI AND NIGERIA CAME FOR WAR.WE ARE ZIONISTS AND ALSO PREPARED TO DESTROY ZOO FROM NORTH TO SOUTHWEST. IT IS ONLY A FOOL LIKE TERRORIST MBUHARI AND IDIOTS IN ZOO THAT WILL THINK OF WAR AGAINST THE ZIONISTS OF BIAFRA. A COMPLETE DESTRUCTION OF NIGERIA CALLED ZOO IS IMMINENT AS THIS WAR IS BETWEEN ISLAMIC NIGERIAN ARMY AND BIAFRAN ZIONISTS ARMY.WE ARE ALL OVER AND IN A LITTLE TIME THE NEW WORLD ORDER GAME SHALL BEGIN IN ZOO AS BOKOHARAM IS JUST A MESSENGER FOR BIAFRAN REPUBLIC IN THE ORDER OF GREEN/WHITE COALITION MOVEMENT.#ZOO MUST FALL#BIAFRA/ISRAEL RISING. URS BIAFRAN RABBI. Coward die many times before their death. This cowardice Mohammadu Buhari shall die many times be his death. This man call Buhari goes about to carry out genocidal killings of Biafra, yet he is afraid to face death himself. When death stare Buhari face, he runs away! Yet Buhari gives orders to have Biafrans murdered in millions. Buhari accused Mazi Nnamdi Kanu of having two passports because of his dual citizenship. Yet his daughter who is about to get married also have the same dual citizenship and she carries two passports. A person with dual citizenship carries two passports and it is not at all a crime. It is only this lunatic coward called Buhari who is very afraid to stare death in the face, that accuse's an innocent person of dual citizen when his very own daughter has dual citizenship and carries two passports. She is about to get married and Buhari is the one to foot the entire bill. Wastage is all Buhari is into with Biafra resource money. Many days are for the thief but just one day is for the owner. It is all over for the fake fraudulent British experimented expired Nigeria country that is awaiting its burial!!! The Sept 23 sit-at-home order by IPOB leadership which was hugely successful and today, Dec 22 massive protest against Buhari visit to Enugu for Economic and Security Summit, who chickened out because of serious warning by IPOB leadership that he Buhari is not wanted in Biafra land is an indication that Biafrans are formidable and united. Kudos to IPOB leaders! Kudos to Enugu IPOB! Kudos to all Biafrans who descended in Enugu today. So proud of all of you. Biafra is here. All hail Biafra nation.